Two months ago I had the amazing opportunity to travel to Dublin and Barcelona. It was a trip totally inspired by my family. My brother Justin and sister-in-law Bre were going to travel through Ireland for two weeks and then spend a week in Barcelona with their 16-month-old son Kayden. That was an opportunity I could not pass up, to spend time with my family exploring another country, was like a dream. It was an amazing trip with some unfortunate mistakes and surprising insights and I wanted to take a moment to share a few of both. Making my way to Ireland's Eye from the dock at Howth Summit with some other excited visitors. 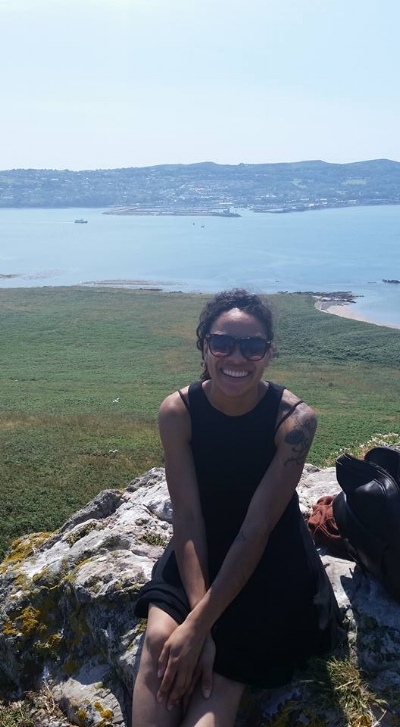 I had made one previous trip to Ireland in 2014 and there was no question that I needed to return and experience this beautiful country again. This time around I only had two days to explore before meeting up with Justin and Bre in Barcelona and I wrestled with what I should do. When you have only a short time in a place it is easy to feel overwhelmed by the choices while also discouraged by the limitations because no matter what it can't all be seen or done. The advice I decided to put into practice was to combine the things that bring me joy and the feeling of the moment. The spontaneous inspiration. So, waking up on my one full day in Dublin I felt the urge to conquer natural terrain. I am not a master hiker by any means, but I aspire to it and love nature. And Ireland has some beautiful nature. I had heard of this place called Ireland's Eye on Pinterest (my hub of all things fashion, travel, books, food…really ALL the things). It is a small island off the coast of Howth Summit, about an hour out from Dublin. When I got off the bus I breathed in the fresh salt air and saw the Eye in the distance. Drawing me toward it was not just its covered peak, but melodic folk music by a local artist at the end of the long pier. He was singing to visitors and locals alike, each of us sitting on (and some fishing off) these great Colosseum like steps on the edge of the ocean. The simplicity impressed me. Dublin is a beautiful city with great character and wonderful urban life, but I loved the feeling of escape from the busy streets. Here the pace was slower. The trek to the top demanded a lot of me and I was conscious of the fact that I was out of shape, wearing an outfit that was unorthodox and impractical for a hike. Despite all the discomfort I was not discouraged because every glance, all around me, was amazing. I continued to stretch my limbs as I climbed up massive rocks and apologetically interrupted the hundreds of birds crying to the air (or at me). Their presence was overwhelming and familiar, strangely comforting too, as they looked so much like the seagulls from home. It reminded me of the Seattle pier, a companion of nostalgia that I welcomed, as I conquered this mountain. Later I discovered Ireland's eye is home to thousands of species including a variety of gulls so my novice bird identifying proved kind of effective! Quite proud of that. Yeah it was a dress...but I wore good boots! And most importantly I made it to the top. This city is beautiful and I fell most in love with the architecture. The work of Antonio Gaudi is one of the most interesting I've ever studied in school and its impression when I saw it in person was nothing short of breathtaking. The Sagrada Familia here and below. Now, I mentioned unfortunate mistakes and it is one I know I'm not alone in experiencing. Two days before my flight home, I lost my phone. Or it got stolen. What transpired is still unknown, but when I entered the tunnel station I had my phone and when I exited, it was gone. I'm now realizing it is good I'm writing about this because I still feel the pain of regret so this is very helpful. It was a frustrating experience because much of what I valued was in that phone. The valuable were cherished conversations via texts and recordings and photographs spanning months before my trip. The photographs, in that moment outside the station, were the most painful to lose. All the moments I captured in Spain and some of Ireland were gone and I made the terrible mistake of not having a backup sync set up when I took photos. This was the first time I had experienced theft and as a somewhat seasoned traveler I still held the naive attitude that I wouldn't let that happen to me. I am careful and cautious, but it took one moment when my guard had relaxed, that all my care and caution failed. So, my advice, as obvious as it is, have a continuous backup system in place for all your photos and documents. I relied upon the plan to upload my photos onto Facebook along the way (as I had thankfully done with part of my Dublin trip), but events like this occur so suddenly that isn't always the best way to keep things protected. Photos are not everything, the experience is everything, nonetheless it is painful to know I can't look back on those experiences the same way. With that said, not having a phone to take photos, use GPS and maps to navigate, search on google to find interesting places near me, was a great experience. It taught me a measure of self-reliance that I had yet to know. Now I will be honest, I was not left in complete technological darkness...my brother let me borrow his iPad, which can take photos and has WiFi when available (Quick digress: I almost wish he hadn't so my tale to readers would be more pure and compelling, but without it I would surely have missed my early morning flight so I will accept it). Even with Justin's iPad I was still required to depend more on myself than my phone. WiFi is a persnickety thing that can be unreliable and I often found it to be just beyond my grasp. One more bar, just one more, and I'd be there, yet it would never come. So, I decided that on my last full day in Barcelona (now on my own as my family flew out that morning) I would not stay in my hostel, safe as it may be, but continue the adventure I envisioned. I'd just have to plan it old school style. In my hostel dorm, I used their WiFi to write out the directions to each spot I wanted to visit; the Sagrada Familia, Placa Reial, and Parc del Laberint D'Horta. I even drew out a crude drawing of the route to give myself a sense of direction. These little pieces of paper proved very fruitful if not entirely accurate. On my way to the Parc del Laberint D'Horta, my weird lines weren't matching up with the intersections I had noted so I ended up meandering in the wrong direction for awhile. Community at it's best. Sadly location unknown, but a few miles from Parc del Laberint D'Horta. 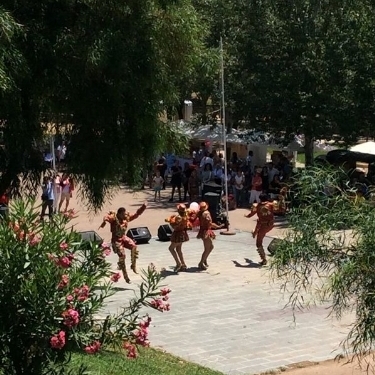 And came upon a lovely sight of people performing different Spanish dances. They wore beautiful costumes and performed for a small mass of people in a tiny park off a highway. In my stress of being slightly lost I took a seat on the grass area and took in the wonderful music. I reveled in the moment, which so easily could have been missed had I gone in the right direction. By the day's end I had succeeded in navigating to each location and felt very gratified. It was a fulfilling last day in Spain. Top left photo: Placa Reial: a wonderful market full of vendors selling books, antiques, and other novelties. All others were of the Parc del Laberint D'Horta: a beautiful park with a hedged labyrinth maze in the middle. There is so much more I could write about from this trip, but I will close it here for the time being. Life isn't without its risks and challenges or without its upsets and disappointments. Sometimes that is felt most poignantly with travel because that time is supposed to be a glorious escape, but it's still life and therefore subject to imperfection. My point is the experience of travel is so worthwhile, the things learned that challenge and mature you, you carry always. Don't let the fear of mistakes or negative occurrences keep you from enjoying the time away because it all contributes to your knowledge and growth. It certainly has for me.